What Team Will Eli Manning Play For in 2018? It’s never good when your team has odds on a next head coach and odds on what team your franchise QB will be on next year. That’s right, we now have odds on the next Giants’ head coach and odds on where Geno Smith will play next year. 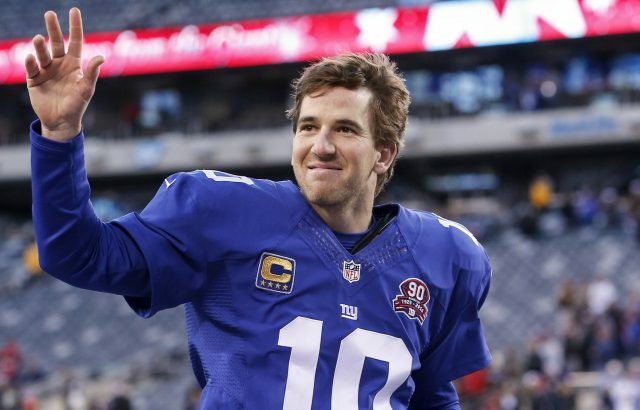 Oh, wait a second…they’re telling me it’s actually Eli Manning that is the franchise QB, not Papa Geno. Very interesting…anyway, here are the odds via MyBookie. From the Big Apple to Sacksonville. What a potential career path for Eli. The Jaguars have already signed Blake Bortles’ option for next year and they are having a surprisingly good season so I don’t really see any value at +300 for Manning to go down to Florida. The only real reason it would happen is because Tom Coughlin is a front office big wig for the Jaguars. Even so, I feel like there are more likely options at better prices. Sticking with the Giants and new coach ______ is next at +450. They’ve had a year filled with bad luck and injuries and could surely come back next year and go back to their winning ways. He might be pissed off at the franchise given the recent events, but there’s a chance he’s happier now with Ben McAdoo and Jerry Reese out of town. I think this is definitely more likely than going to Cleveland. Of the “other team” options listed, I think that Denver would be my pick. Their quarterback situation is certainly…not good…and they could use a veteran leader under center like Manning. John Elway was able to woo one Manning to the Mile High City already and given Peyton’s success with the Broncos, Eli may want to give Denver a whirl himself. Which outcome do you think is the most likely?